Two hundred and fifty-fourth pope; born at Bologna in 1675; elected pope Aug. 17, 1740; died May 3, 1758. This pope, who graciously accepted a dedication from Voltaire and was full of amenity toward all heretics, thought it his duty to pursue by all means the conversion of the Jews. In 1747 he issued a bull regulating Jewish conversions. According to this bull all children above seven years of age could be baptized without the consent of their parents. A Christian nurse was allowed to baptize her Jewish charge against the will of the parents. One of the latter could baptize the child contrary to the wish of the other; and the grandfather could baptize his fatherless grandchild against the will of its mother. By a decree dated Sept. 16 of the same year, Benedict forbade converted married Jews to divorce their wives according to Jewish law. At the request of the Jewish community of Rome (presented in Feb., 1751) to allow its members to frequent the market and to live outside the ghetto, Benedict renewed the severe project elaborated by the Inquisition in 1732, according to which a Jew was not permitted to pass a single night away from the ghetto. Notwithstanding this, Benedict was far from being hostile to the Jews. On all occasions, except in the matter of conversion, he showed sympathy with them. When persecutions broke out in Poland he energetically defended the Jews and enjoined the Polish archbishop and primate to protect them. In Italy Benedict was especially hostile to Hebrew books. The censor Constanzi prepared in 1748 a new list of forbidden books. Benedict ordered all those enumerated therein to be seized and confiscated; and on Sept. 15, 1751, this decree was enforced. 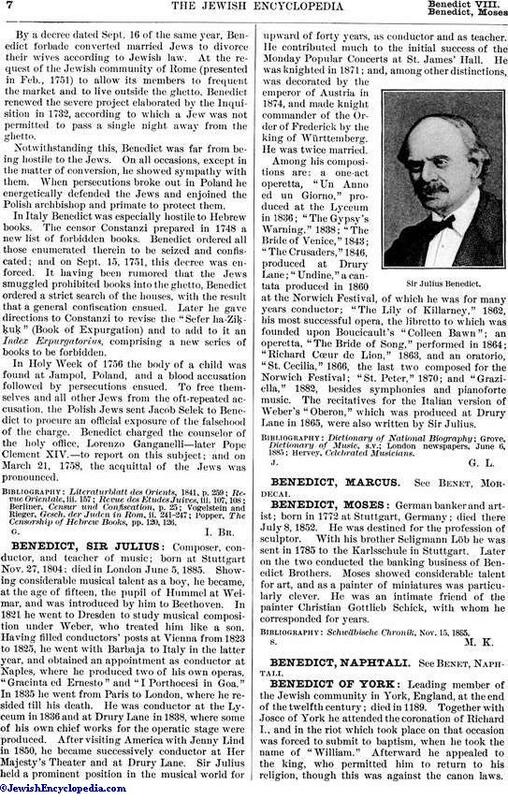 It having been rumored that the Jews smuggled prohibited books into the ghetto, Benedict ordered a strict search of the houses, with the result that a general confiscation ensued. Later he gave directions to Constanzi to revise the "Sefer ha-Ziḳḳuḳ" (Book of Expurgation) and to add to it an Index Expurgatorius, comprising a new series of books to be forbidden. In Holy Week of 1756 the body of a child was found at Jampol, Poland, and a blood accusation followed by persecutions ensued. To free themselves and all other Jews from the oft-repeated accusation, the Polish Jews sent Jacob Selek to Benedict to procure an official exposure of the falsehood of the charge. 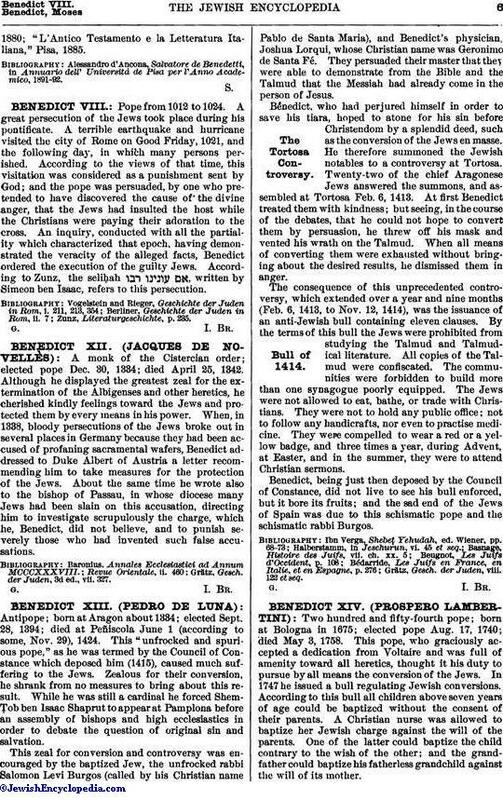 Benedict charged the counselor of the holy office, Lorenzo Ganganelli—later Pope Clement XIV.—to report on this subject; and on March 21, 1758, the acquittal of the Jews was pronounced. Popper, The Censorship of Hebrew Books, pp. 120, 126.